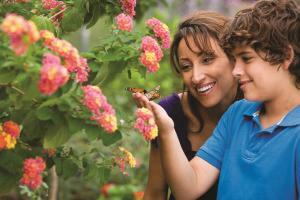 Spend the day amongst blooming flowers and fluttering butterflies at Norfolk Botanical’s Butterfly Festival on Saturday, July 15, 10 a.m.-4 p.m.
Brought to you by the Butterfly Society of Virginia, this family friendly event will offer demonstrations, gardening workshops and fun activities for butterfly admirers and enthusiasts. The Butterfly Festival is visually beautiful, but you can also learn more about the butterfly life cycle and how you can attract butterflies to your yard. The event will have food vendors, music, children’s activities, a beanbag toss, several craft stations, and special butterfly activities in the children’s garden! On-site will be a tram ride that will transport participants to the festival and Butterfly House for an up-close experience with butterflies and caterpillars. Norfolk Botanical Garden is continuing to spread its message to save the monarch butterfly. Mission Monarch: Project Milkweed focuses on the life and issues of the monarch butterfly population. Did you know you can help monarch butterflies by simply planting milkweed, which is the only food source for monarch caterpillars? At the festival, the Butterfly Society of Virginia will be selling butterfly-attracting plants, including four varieties of milkweed. Join in the efforts to save the monarchs! Plan your Norfolk excursion today!